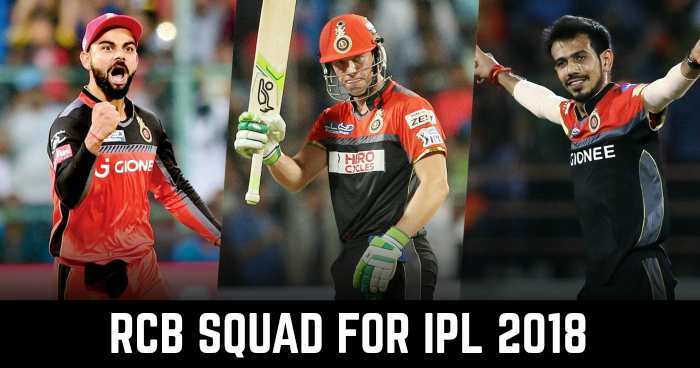 After IPL 2018 Auction again Royal Challengers Bangalore (RCB) looks good on paper as before with the likes of Virat Kohli, AB de Villiers and Brendon McCullum. Despite looking good on paper RCB are unable to win IPL title even once. RCB retained Virat Kohli, AB de Villiers and Sarfaraz Khan before the auction. In the IPL 2018 Auction RCB looks to build a strong team mainly their bowling unit. RCB’s biggest bid was for England all-rounder Chris Woakes which was bought for Rs 7.40 crores. RCB also bought all-rounder Colin de Grandhomme and Moeen Ali. RCB also included South African wicket-keeper Quinton De Kock. Royal Challengers Bangalore doesn’t use the Right-To-Match for Chris Gayle and who was bought by Kings XI Punjab (KXIP) for base price Rs. 2 crores. On the other hand, RCB used their Right-To-Match cards for leg break bowler Yuzvendra Singh Chahal for Rs. 6 crores and Pawan Negi for Rs. 1 crore.